Be the first to share your favorite memory, photo or story of Dixie. This memorial page is dedicated for family, friends and future generations to celebrate the life of their loved one. Dixie Glee Herkelman, age 81, of Leon, Iowa, the daughter of Charles Emmett and Bessie Laverne (Lewis) Williams, was born March 13, 1937, in Warren County, Iowa. 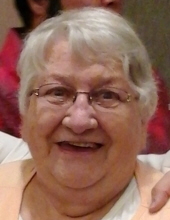 She died at the Clarke County Hospital in Osceola, Iowa on Monday, January 14, 2019. Dixie grew up and attended school in Carlisle, Iowa. She and Carl Junior Lock were married in 1954. They lived in Des Moines, Iowa and were blessed with two daughters, Connie and Carmen, (deceased 1969). On December 31, 1958, she married Dwight William Herkelman in Carlisle, Iowa. His four children, Sam, Robert, Melvin, and Linda, became part of Dixie’s family as they raised their family together along with their own daughter, Dwighta “Dee”. Dixie worked various jobs including at a grocery store and pharmacy in Carlisle, Hy-Vee in Des Moines and then in Leon. In 1996, Dixie and Dwight moved to an acreage south of Leon to retire. In her free time, Dixie loved playing Bingo and going to the casino. She was baptized into the New Salem Baptist Church after moving here and remained a faithful member. Preceding her in death were her parents; daughter, Carmen; two brothers and one sister-in-law, Kenneth and Sybil Williams and Keith Williams. Survivors include her husband, Dwight Herkelman of Leon; children, Sam and Karen Herkelman of Shell Knob, Missouri, Robert and Jan Herkelman of Brandon, Florida, Melvin and Patty Herkelman of Walcott, Iowa, Connie and Bob Probasco of Des Moines, Linda and Terry Miller of Portage, Pennsylvania, and Dee and Jerry Winebrenner of Leon; 18 grandchildren; 37 great grandchildren; four great, great grandchildren; sister-in-law, Darlene Williams in Altoona, Iowa; Dwight’s siblings, David Herkelman, Delores Tate, Marilyn Burkheimer, and Carol Van Fosson; nieces and nephews; and other relatives and friends. Funeral services will held at the Slade – O’Donnell Funeral Home in Leon, Iowa at 10 a.m. Tuesday, January 22, 2019, with Pastor Dale Short officiating. Burial will be in the Carlisle Cemetery, Carlisle, Iowa on Tuesday at 2:30 p.m.
To plant a tree in memory of Dixie Glee Herkelman, please visit our Tribute Store. Family will receive friends 6-8 p.m.
Graveside in Carlisle Cemetery, Tuesday 2:30 p.m.
"Email Address" would like to share the life celebration of Dixie Glee Herkelman. Click on the "link" to go to share a favorite memory or leave a condolence message for the family.